Before electric light there was gas lighting in Brisbane. The Brisbane Gas Company started producing in 1865 at its site at Petrie Bight, and Brisbane's expanding population over the ensuing two decades demanded that a second facility be constructed at Newstead. 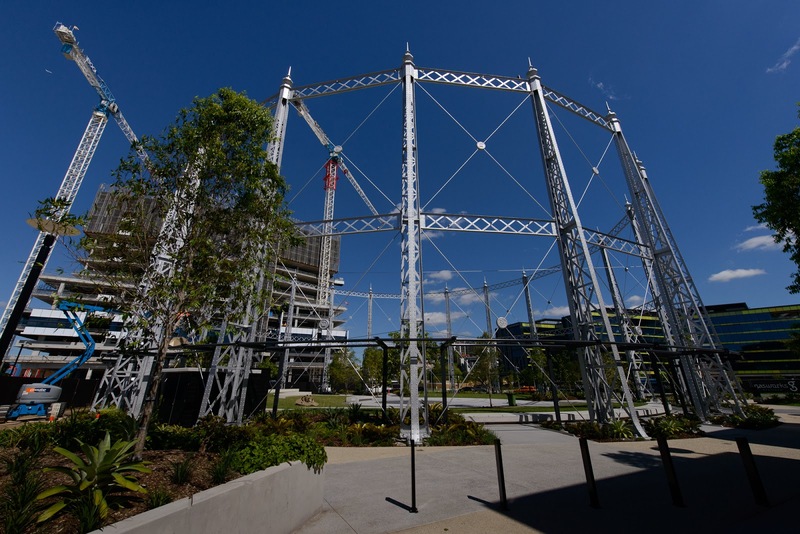 That gasometer was erected in 1887 and operated through to 1996 when natural gas took over. We previously looked at this site when it was first being redeveloped. All of that reclamation work has finished, but there are still cranes and workmen there constructing apartment buildings, office towers and shopping complexes. I dined there just recently with some old friends (well, they're not old and neither am I - it's just that we have known each other for a long time) and I noticed that the new coffee shops, bars, restaurants and provision shops next to the gasometer are doing a roaring trade. The remaining frame of the gasometer has been made a feature and is lit up at night, making it somewhat of an attraction in its own right. It was always a landmark/eyesore wasn't it. We went there recently too, easy parking and a great atmosphere. I love how Brisbane is recycling it's buildings and landmarks. I think you'll find that the first image is of a second Gasometer located between Doggget and Kyabra Streets, the site currently occupied by the Newstead Commercial Village. This image appears to be looking down Kyabra Street from Commercial Road, with the top of the Gasworks Plaza Gasometer just visible in the bottom left of the image (skyline above the road). Hi. Well spotted: that is definitely a different structure. It would be interesting to know the date of the photo above. The history I've been able to find is that the gasometer that remains at Newstead is (the remnants of) gas holder no. 2. Gas holder no. 1 was at Petrie Bight. Gas holder no. 3 was built on Dogget St but not until in 1939 and was quite a bit larger than 1 or 2. Gas holder no. 2 was first built at Petrie Bight in 1873 before it was located to Newstead in (around) 1887. As a fascinating reference, Google 'map of brisbane 1888 illustrated sydney news'. In the map you'll find you can make out gas holder no 2 at Newstead and the remains of gas holder no 1 at Petrie Bight, just near Customs House.